Undo Trash: What's this feature all about, and how does it appear? An iOS hidden feature surprised P.M. Wright. She had deleted an email in iOS and a pop-up appeared that asked if she wanted to “Undo Trash.” She’d never seen it before, and wondered what precise action it would accomplish—undo the deletion of all her deleted email? And where does deleted email wind up and for how long? A series of excellent questions that all involve implicit behavior that average users aren’t required to learn about and Apple doesn’t fully expose, because it’s not typically necessary to understand. Shake your iOS device in many apps and an undo option appears. The Undo Trash message is a “hidden” feature: after taking an action in many Apple and third-party apps, you can shake your iPhone gently, which the built-in accelerometer detects. Software that supports undo can then display a message. It’s nifty, but if you don’t know about it, a surprise! Tapping Undo in any app typically is a single operation. Only the immediately previous action gets reverted. In this case, the message you just trashed gets restored to the mailbox from whence it was plucked. But this brings up the deeper question P.M. asks: where does deleted email go and when is it removed from one’s email account? With most modern email accounts, when you delete a message it’s moved from a mailbox, like your Inbox, to another mailbox labeled Deleted Messages, Deleted Items, or something similar. 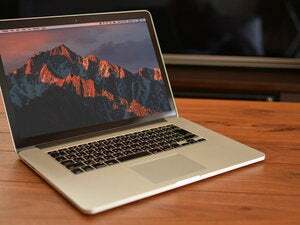 But it remains on the system that you interact with to retrieve mail, whether that’s Apple’s iCloud, Google’s Gmail, or another. 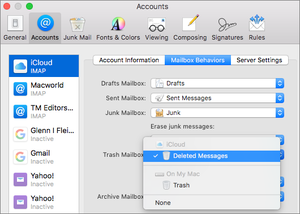 You can change the destination of trashed items in macOS Mail. iOS doesn’t store mail locally on a permanent basis the way that macOS does. iOS Mail always considers itself to be looking at a retrieved, temporarily cached copy of your central email storage. macOS can retrieve mail and store it in local folders and then either retain it on the server or delete it. You can also keep all email on the server and move specific messages (like archives) from the server to local folders in Mail to reduce online storage requirements. 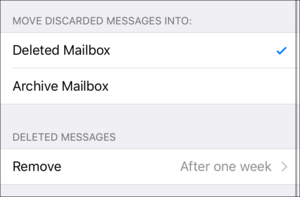 iOS lets you change how quickly it removes deleted messages from your email hosting service. Both iOS and macOS’s Mail apps automatically delete email from active email accounts they routinely check for new messages after a preset period of time. The default for iOS is one week; the default for macOS is one month. To change the iOS setting, you have to dive deeply. Open Settings, and then tap Mail. Tap the Accounts link at the top, tap the account for which you want to change the setting, swipe down to the Advanced section at the bottom and tap Mail, swipe down to the bottom and tap Advanced, and then you can finally tap the Remove item below Deleted Messages. This lets you change the automatic deletion period. In macOS, select Mail > Preferences, select a mail account at left, and then click Mailbox Behaviors. From the Trash Mailbox menu, you can select how frequently and to which mailbox to delete messages.